Singapore, like almost every other industrialized country, is home to railroads that once formed the bedrock of its modern economy. Nowadays? Not so much. The current KTM line by Nic on Flickr/CC. These were elegant spaces, built in the latest styles, and they heralded the modern age—like the Tanjong Pagar Railway Station, a venerable Art Deco station that has sat abandoned since the line shut down. The Tanjong Pagar Railway Station by Azhaaarry on Flickr/CC. The line was only shuttered four years ago, in 2011, and the Singaporean government was left wondering what to do with its remains—especially the lovely, if old, stations that dated back to the 1930s. Like so many other countries that struggled to figure out a way to use their abandoned infrastructure, they launched a design competition. The winning design, by the Japanese design firm Nikken Sekkei and published by ArchDaily, is essentially a 15-mile-long park “spanning the entire nation of Singapore,” in the architects’ words. 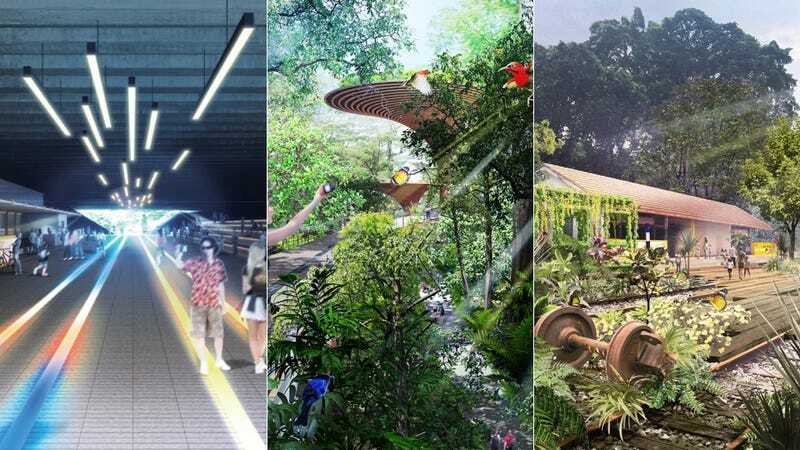 What Nikken Sekkei is proposing will feel sort of familiar to anyone who has walked along New York’s High Line, Chicago’s 606, Paris’s Promenade Plantée, or any other reclaimed railway-turned-community park. But the sheer length of Singapore’s railroad meant that the designers needed to think way bigger. Nikken Sekkei envisioned a green causeway linked by eight different hubs, each anchored by a historic station, that are devoted to things like community gardens, viewing platforms nearby the city, and even a fishing pond. The idea is to use the greenway as “a catalyst to development and community bonding,” and increase biodiversity, too. And the old Art Deco station at Tanjong Pagar? A design by MKPL Architects and Turenscape International was chosen for the abandoned space. It’ll be restored as one of those hubs, where “art clubs, a railway gallery, exhibition space, auditorium, cafés and modular pop-up community kiosks,” will fill the former railway station. It took New York almost a decade to complete the full 1.5-mile-long High Line; doing the same for the 15-mile-long Keretapi Tanah Melayu line will presumably take a little longer. For now, the designers at Nikken Sekkei will focus on completing a first chunk, only 2.5 miles long. But it’ll be interesting to watch as the project emerges—and as other countries inevitably find themselves wondering what to do with their outdated infrastructure.